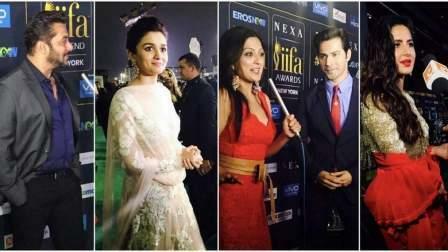 The lobby of a hotel at the bustling Times Square area here was full of NRIs waiting to catch a glimpse of their favourite Bollywood stars, who have descended in the Big Apple for the 18th edition of the IIFA Weekend and Awards. From fans sporting colourful 'pagdis' and a family of three flaunting T-shirts reading "Shah Rukh's fan", "Salman's fan" and "Aamir's fan" - the excitement level was unprecedented as they welcomed the celebrities for the kick-off press conference on Thursday evening at the Sheraton hotel. Salman Khan, Anupam Kher, Nawazuddin Siddiqui, Katrina Kaif, Shahid Kapoor, Alia Bhatt, Varun Dhawan, Kriti Sanon and Sushant Singh Rajput apart from DJ Dwayne Bravo set the pace for the IIFA celebrations. "We hope this is a weekend of laughter, happiness and joy of coming together in one of the biggest cities in the world," Sabbas Joseph, of Wizcraft International Entertainment, the creators and producers of IIFA, said. "It's not everyday that the stars come to New York City. This is really India's soft power at its best as we try to develop a relationship with the US further. "I think people are at the heart of relationships -- and people-to-people relationships strengthen relations between countries. So, I think events like this when they happen, it's better late than never. "New York is a great selection for the show as it gets great visibility for India because Times Square is really a place where the world meets. It's a great opportunity for us to show our soft power," said Das. At the conference, DJ Bravo also made the stars groove to a number that he sang live, and the fans cheered for the Bollywood celebrities by shouting "Chal beta selfie le le re", "We love you Salman" and "Alia, you're the best". Salman, in his typical style, said: "Chup baith jao... Awaaz lag rahi hai kaan mein. Love you too."